Some years ago one of our teachers acted as a substitute for another yoga teacher at an evening school. The students had attended yoga classes regularly for eight years, but had never tried this programme. They were greatly surprised to discover the perceptible effect of these simple exercises. Pawan means wind, mukta to liberate or to release and asana a yoga pose. Pawanmuktasana is an easy programme, that can be practised by most people without difficulty. It is the first yoga programme one follows on the elementary courses. Often considered a programme for beginners and the elderly, it provides a good foundation for the more advanced yoga poses. Pawanmuktasana, however, is more than that. Its effects to the experienced yoga practitioner are highly beneficial. Pawanmuktasana consists of a series of movements, effectively freeing joints and muscles from stiffness and toxins, and releasing wind from the intestines. You start by bending and stretching the toes and insteps, then you make circles with the feet, followed by a bloodpumping exercise whereby you bend and stretch the legs and feet. 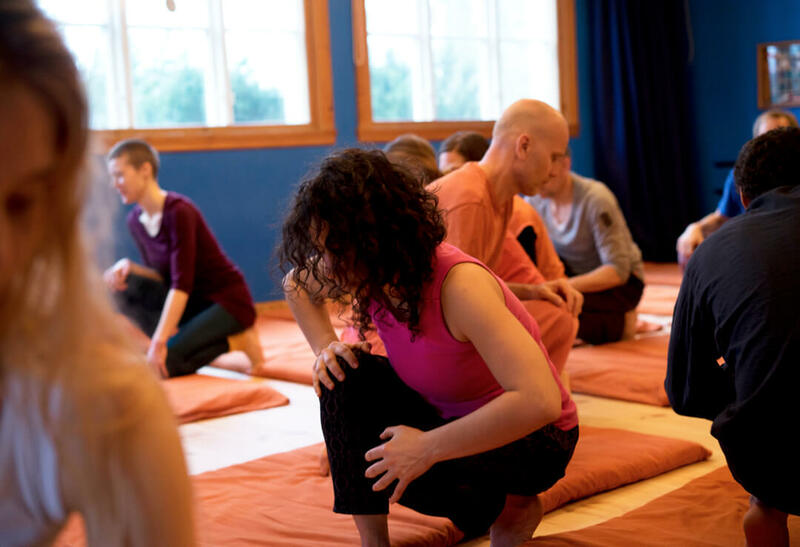 Then you proceed to the hands, making fists and stretching the fingers, bending the hands up and down from the wrists and then rotating the clenched hands. Next the joints of the arms and shoulders are stretched, bent and rotated. Systematically one moves through the body. The neck, hips and even the involuntary peristaltic movements of the intestines are affected. After this programme of movements you take a break, lying completely still on the back. Swami Janakananda describes and fully illustrates the Pawanmuktasana programme in the book Yoga, Tantra and Meditation in Daily Life. We will now consider the deep effect these exercises have on the body’s energy, the prana. Prana is another word for the psychic energy, which is known in both China and India. In Europe it was first called vital-energy, later bio-electrical energy, and at some point the Austrian psychoanalyst Wilhelm Reich renamed it Orgon-energy. The Sanskrit word for this energy is Prana and it is thoroughly described in the Tantric yoga texts. In China it is called Chi, in Japan Ki. The prana has various functions in the body. Briefly, one prana or energy is responsible for digestion, another for elimination, a third is connected with the breath, a fourth flows through our sensory apparatus, and through the legs and arms. Finally a fifth prana has the all over function of gathering and balancing the energy of the body. In yoga, the prana and the manner in which it flows is influenced by the poses and especially by the breathing exercises, whose real purpose is to make one conscious of the energy: prana-yama. Later, when you master yoga and have learnt to visualise and meditate, you can learn to heal through the conscious influence of this energy, this technique is called Prana Vidya, the knowledge of prana. We return to these subjects again in other articles, as they are integral to the teachings of yoga. The following is taken from a research by Dr. Motoyama, made in collaboration with Swami Satyananda, based on the former’s knowledge of Chinese acupuncture. According to Ayurveda, the classical Indian medicine, the body is controlled by three ” body fluids“: phlegm ( kapha), wind or air ( vayu), and acid or bile ( pitta). Irregularity in the function of any one of these three “fluids” upsets the body’s metabolism, and this is considered a fundamental cause of disease. Vayu doesn’t only refer to gases in the stomach and intestines, but also to a coarse form of prana, which one may conceive of as a subtle body “fluid” that flows through the nadis (the energy channels). The flow of ki-energy (or prana) is easily impeded; especially at the joints. A poor flow here can cause rheumatic pains and result in a deficient energy flow throughout the entire body, which in turn can be the cause of many disorders. With Pawanmuktasana the flow of prana through the nadis is stimulated, primarily by removing the blockages in the joints. Note that, with the legs, one starts with the toes, moves on to the ankles and knees and ends at the hips. With the arms, one moves from the fingers to the wrists, elbows and shoulders, in that order. Before doing Pawanmuktasana or other yoga programmes, it is recommended that you lie completely still on the back. It relaxes the body, and allows the prana to be easily absorbed and distributed. There are twelve major meridians of ki energy, which run over and through the body; most of them are related to one specific internal organ, which they pass through. The terminal points of these meridians are located in the fingers and toes, and are known as sei (“well”) points. For example, the sei point of the lung meridian is located in the thumb and that of the large intestine is at the tip of the index finger. Likewise, the rest of the sei points are placed in the fingers and toes on both sides of the body. The sei points are very important, as it is through them that the ki energy enters and leaves the meridian. The energy level at these points is said to accurately reflect the condition of the entire meridian. It is known that in cases of acute illness, acupuncture at these points has an immediate effect. 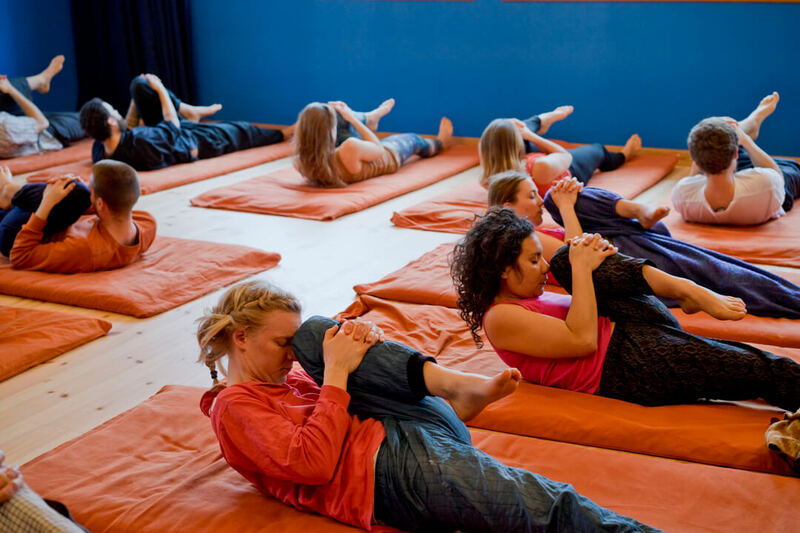 The exercises in Pawanmuktasana, where one clenches the hands and bends the toes, stimulate the sei points directly, and consequently promotes the circulation of ki energy (prana). Chinese medicine also speaks of gen (“source”) points, located either in the wrists or ankles, or between the sei point and the joint. Diseases of the internal organs are often reflected at the gen point of the meridian concerned, and treatment there is often prescribed. Bending and rotation of the ankles and wrists stimulates the gen points and thereby helps to normalise the function of the internal organs that are connected with the twelve meridians. The above explanation of sei and gen points is found in The Yellow Emperors Treatise on Internal Medicine – the oldest text of Chinese medicine, which also states that the knee and elbow joints are closely associated with the gen points, and that they too can be important when treating diseases of the internal organs. Therefore stretching and bending of the knees and elbows is also beneficial, and the same applies for stimulation of the hip and shoulder joints. In Western medicine, the joints are considered vulnerable areas of the body. Fluid tends to accumulate and stagnate there, and the whole body gradually becomes fatigued. This condition can lead to rheumatism and neuralgia, which is a common complaint. In this context the benefits of Pawanmuktasana are inestimable. In addition to improving the flow of ki energy through the meridians, the programme promotes the circulation of blood and body fluids through the joints, thereby helping to cure illnesses and maintain good health.